This is another recipe that I came across and tweaked a bit. It originally called for half an onion (minced and sauteed before the mushroom pieces get tossed in with it), which is traditionally a main ingredient in risotto and gives it a lot of its flavour. I'm allergic to onions, and the risotto is fine without it. Fennel might make an interesting substitute. I also used cremini mushrooms for the entire recipe though it suggested substituting white mushrooms for the caps and adding shiitake or oyster mushrooms to the risotto itself. White mushrooms are much more readily available and do work but don't have nearly as much flavour. Honestly, you'll probably be underwhelmed or a little disappointed if you use them. Adding the meatier minced mushrooms to the risotto itself, however, is a good idea. Wash and stem the mushrooms. Dab them dry and place them open side-up on a baking sheet. Add the olive oil to a skillet or large saucepan on medium heat. 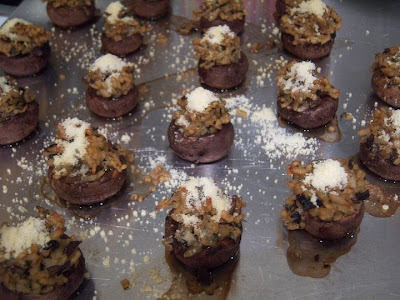 Chop up the mushroom stems and however many additional creminis you want to add to the risotto or based on how many stuffed mushrooms you'd like to end up with. This is normally when you'd want to sautee the onion for a few minutes. Once the onions are transparent, add the finely-chopped mushrooms and cook 10 - 15 minutes. Mix in the garlic and thyme, then the rice, and cook for a few minutes, stirring occasionally. Add the wine (just splashing in a bit is fine) and let it simmer until most of it is gone. Then, add the veggie broth and salt, if desired. Bring everything to a boil, cover, and let simmer for 20 minutes or until the liquid is absorbed. Remove from heat and set aside. Stir in the parsley. Preheat the oven to 400. What I like to do is add a bit of cheese to each cap so it'll be all nice and melty in the center of the stuffed mushroom. Generously fill each cap with risotto, pressing it down a little to keep it in place better. Bake for about 20 minutes, or until the caps are well-cooked and the risotto starts to brown slightly on top. These are simple and inexpensive to make but are very flavourful, meaty and satisfying. I guarantee they'll be a hit for any occasion.